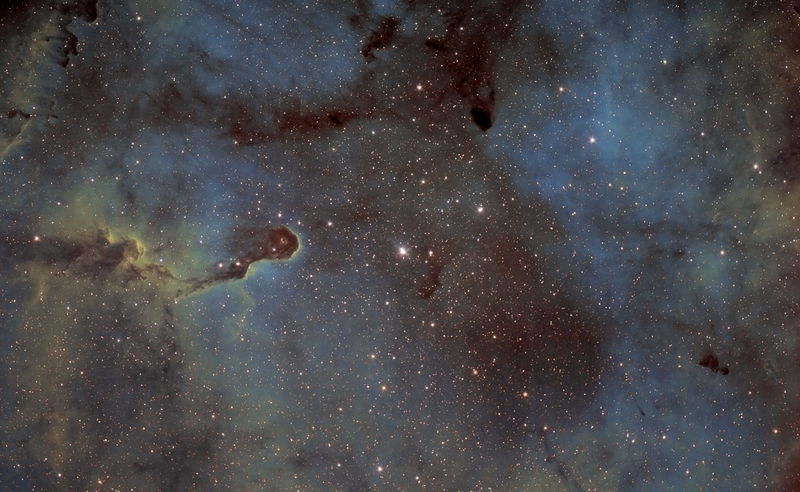 The Elephant's Trunk nebula is a concentration of interstellar gas and dust in the star cluster IC 1396 and ionized gas region located in the constellation Cepheus about 2,400 light years away from Earth.The Elephant Trunk nebula is now thought to be site of star formation, containing several very young stars. Two older stars are present in a small, circular cavity in the head of the globule. Winds from these young stars may have emptied the cavity. This is my first image in Hubble Palette. More exposure would be needed for SII and OIII, but I'm quite satisfied with the result.